It’s summer. Here in the drought plagued Southwest US, it’s a badge of honor to not water your lawn. It’s even more of a badge of honor to replace it with xeriscape, create water-retaining structures like a berm-and-swale system, and recycle . 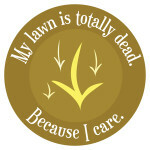 . . → Read More: My lawn is dead. Because I care. Our lighting section just got a major overhaul, courtesy of meticulous researcher Paul Robbins of the Austin Environmental Directory.